Learn about the temperament and personality of the Field Spaniel. Discover what he's like to live with, his traits and characteristics and how he generally behaves. And look at lots of Field Spaniel photos. 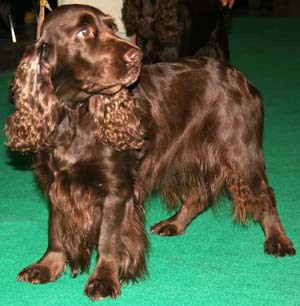 The Field Spaniel is an active, intelligent, inquisitive, energetic, and athletic dog who loves human companionship. He will often choose one person in the household (not necessarily the one he is supposed to) and become that person's shadow. Field Spaniels thrive on interactions with their loved ones and don't do well if left alone. They want to be involved in all family activities, especially the ones that include rides in the car. If Field Spaniels get lonely, they will bark, and possibly remove your wallpaper. They are usually not problem barkers, but when they do bark, they have a "bid dog bark" surprising for their size. In addition to their bark, they also like to whine and yodel. Oh, and they also snore. They will bark and/or destroy things if they get bored. These are intelligent dogs who like to have a job to do, and they will enjoy doing just about anything as long as it is with their humans. They love to play outside. They are adaptable, fun-loving, playful and trusting. If you say something is a good idea, then it must be. Field Spaniels act like puppies, with an enthusiasm for life, for a long time. They are reserved with new people, but quickly warm up to them. They need daily exercise. They were, after all, bred for activity and endurance. They enjoy brisk walks, jogs, or ball chasing. These are unusually docile, sensitive, and affectionate dogs, who might try to lick you to death. They are gentle, affectionate, loving, and devoted. The Field Spaniel sheds a fair amount of hair. You'll find hair stuck to your couch, carpets, clothes and everything else in your home.